Built in 1790, Portland Head Light [above] in Fort Williams Park features a maritime museum. Beyond just lobster and lighthouses, Portland offers local arts, ethnic fare, briny air, and more. I was feeling lucky in Portland, and I didn't have to guess why. “Lucky” was a man-size lobster (Homarus americanus) walking down Exchange St., embracing each person he saw. If I didn't feel loved in Maine before this exchange, I certainly did afterward. For a while, I even swore off eating lobster; that didn't last long. 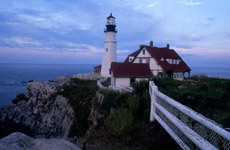 Portland sits on a peninsula that juts into Casco Bay, along Maine's southern coast. A two-hour drive (or a ride on Amtrak's Downeaster) from Boston, Portland is a geographically compact city of 64,000. “Big enough to discover new things all the time,” says Klein, “but small enough to feel like you could know everybody.” The historic Old Port Exchange area, near the harbor, is the city's hot district for strolling, shopping, and eating. “Munjoy Hill's Portland Observatory dates to 1807 and, from its upper deck, offers amazing views of the water and city,” says Chris Busby, former editor of Casco Bay Weekly. Some attractions are all fun and games: The Portland Sea Dogs (AA baseball farm team for Florida's Marlins) thrill crowds at Hadlock Field. A serene alternative to the ballpark, Two Lights State Park, in Cape Elizabeth, offers great ocean views and beach walks. Its lighthouse was made famous in paintings by Edward Hopper, who is studied along with such Maine painters as Winslow Homer (and the Picassos and Renoirs of the world) at the Portland Museum of Art. Among the city's showier attractions, the Public Market is a timber-framed circus of fresh fish, flowers, cheese, bread, and everything fun to eat. But don't let this keep you from visiting the creaky Harbor Fish Market, where just-caught seafood dances from boat to plate. Locals like to joke about their “anti-tourist campaign,” which features blackflies (there are none) and kooky weather. Sunshine permitting, two walks are essential: on the Harbor Trail of the Eastern Promenade you'll get good views over Casco Bay while walking alongside a narrow-gauge train that kids dig; and along the Western Promenade you'll see one of America's best Victorian neighborhoods, which is near the Victoria Mansion (and its stained glass skylight). For a creative kid-friendly diversion and a panoramic view of the city and its waterfront via camera obscura, head to the interactive Children's Museum of Maine. “Folks say that Portland has as many places to eat per capita as San Francisco; with about 400 restaurants for 64,000 people, I believe it,” says Diane Hudson, Portland Magazine food writer and 30-year Portland resident. Hudson praises the city's range of ethnic caf�s (from Thai to Indian to Salvadoran), but for “lamb that never tasted better,” she goes to Cinque Terre. “The Ligurian dishes are perfectly pestoed, and each plate is a novel twist on traditional Italian.” Longfellow Square's Local 188 is another Hudson haunt; “its fresh and garlicky Spanish tapas and the local artists' work hanging from the walls create a funky, urbane mood.” Of course, Portland is a place for fish, and the Public Market's Commissary and Old Port's Street & Co. capitalize on the city's harbor with sublimely prepared oysters, broiled scallops, grilled Atlantic swordfish, lobster dishes, and more. But for quicker cuisine: Gilbert's Chowder House serves the city's freshest soup (in a bread boule); Flatbread Company (near the Casco Bay Ferry Terminal) bakes organic pizzas that sustain even the most indefatigable island hopper; and, for breakfasts with staying power, locals eat at Becky's Diner, but they arrive early, and so should you. Nancy Grayson, keeper of the Portland Museum area's Cunningham Books, runs her fastidiously arranged used bookstore for locals, but “Saturday is Boston Day,” she says. Each weekend the city fills with shoppers who make the trip from Boston for good reason: a liberal mix of charmingly quirky stores. Along Old Port's Exchange St., Amaryllis Clothing Co. serves stylish women who covet the boutique's creative line; Abacus is a hothouse of clever American crafts, jewelry, and furniture; Treehouse Toys is a beehive of childish amusements; and Fibula specializes in elegant rings and things crafted by Maine jewelers. “The best stores in Portland celebrate local artists,” says Fibula's Edith Armstrong. Proof of this is the Maine Potters Market, a cooperative that sells glazed earthenware and ceramics. Cooks will love the provision paradise at Browne Trading Market. Impossible to miss (they're everywhere) are the many antique and art galleries, which sell nautical knickknacks, watercolor paintings, and more. A perfect evening in Portland would begin with a performance (which ranges from Cambodian dance shows to Celtic music concerts) at the Center for Cultural Exchange, a nonprofit organization dedicated to global arts, or the Portland Symphony Orchestra at Merrill Auditorium. But, sooner or later, every person in Portland goes to Gritty McDuff's, a two-story pub that serves okay grub and brews exceptional beer. “We always carry seven on tap,” says Gritty bartender Suzanne Grimaldi. “Portland Headlight Pale Ale is most popular, but in summer try a Black Fly Stout.” Locals also love Brian Ború, a pub dedicated to a strange blend of Irish whiskey and live reggae music. Portland institution Bubba's Sulky Lounge is a wonderland of antique soda fountains and homespun charm. Hipsters can shake a leg at The Skinny, an art-house-crowd haven for rock jams and poetry slams. For a nightcap, grab an ice cream cone at Beal's or a latte at Breaking New Ground and walk the cobbled streets. “The Victorian homes and gardens of the Western Promenade neighborhood make for sensual retreats,” says Pomegranate Inn manager Chris Monahan. For soothing sleepovers in a pied-à-terre setting, the art-filled Pomegranate Inn delivers bliss with breakfast. At The Percy Inn, an 1830s Federal-style brick row house, each of its ten suites has a distinct style, from Maine cottage to Antiques Roadshow. Since 1821, The Danforth has stood as an elegant icon of Portland's maritime commerce; the mansion now harbors romantic guest rooms with fireplaces. The best place to stay in Old Port is the Portland Regency Hotel, a full-service 95-room oasis just steps away from the harbor's briny charms. Abacus 44: Exchange St.; +1 207 772 4880. Amaryllis Clothing Co: 41 Exchange St.; +1 207 772 4439. Browne Trading Market: 262 Commercial St.; +1 207 775 7560. Center for Cultural Exchange: One Longfellow Sq. ; +1 207 761 0591. Children's Museum of Maine: 142 Free St.; +1 207 828 1234. Cunningham Books: 188 State St.; +1 207 775 2246. Fibula: 50 Exchange St.; +1 207 761 4432. Maine Potters Market: 376 Fore St.; +1 207 774 1633. Merrill Auditorium: 20 Myrtle St., City Hall; +1 207 874 8200. Portland Museum of Art: 7 Congress Sq. ; +1 207 775 6148. Portland Observatory: 138 Congress St.; +1 207 774 5561. Treehouse Toys: 47 Exchange St.; +1 207 775 6133. Two Lights State Park: +1 207 799 5871. Victoria Mansion: 109 Danforth St.; +1 207 772 4841. Beal's: 12 Moulton St.; +1 207 828 1335. Becky's Diner: 390 Commercial St.; +1 207 773 7070. Breaking New Ground: 13 Exchange St.; +1 207 761 5637. Brian Ború: 57 Center St.; +1 207 780 1506. Bubba's Sulky Lounge: 2 Cottage Rd. ; +1 207 772 9143. Cinque Terre: 36 Wharf St.; +1 207 347 6154. Commissary: 25 Preble St.; +1 207 228 2057. Flatbread Company: 72 Commercial St.; +1 207 772 8777. Gilbert's Chowder House: 92 Commercial St.; +1 207 871 5636. Gritty McDuff's: 396 Fore St.; +1 207 772 2739. Harbor Fish Market: 9 Custom House Wharf; +1 207 775 0251. Local 188: 188 State St.; +1 207 761 7909. Portland Public Market: 25 Preble St.; +1 207 228 2000. The Skinny: 625 Congress St.; +1 207 871 8983. Street & Co.: 33 Wharf St.; +1 207 775 0887. Percy Inn: 15 Pine St.; +1 207 871 7638 ($89-250). www.percyinn.com. Pomegranate Inn: 49 Neal St.; +1 207 772 1006 ($95-235). www.pomegranateinn.com. Portland Regency Hotel: 20 Milk St.; +1 207 774 4200 ($159-309). www.theregency.com. The Danforth: 163 Danforth St.; +1 207 879 8755 ($109-299). www.danforthmaine.com. The information in this story was accurate at the time it was published, but we suggest you confirm all details before making travel plans.